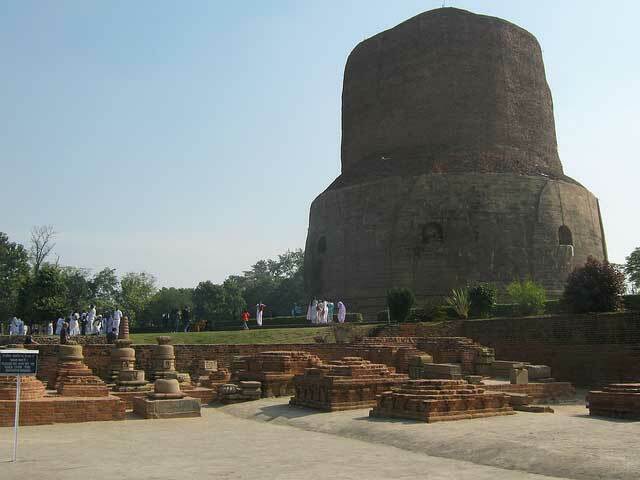 Located 13 kilometers east of Varanasi, Sarnath (in state of Uttar Pradesh) is considered to be the place where Gautama Buddha first taught the teachings of Dharma after his enlightenment. The site was a deer park which became the birthplace of the Buddhist Sangha and is one of the major pilgrimage spot for the Buddhists in India. The name Sarnath literally means ‘Lord of the deer’ and was established by the King of Banaras who created this town as a sanctuary for the deer. 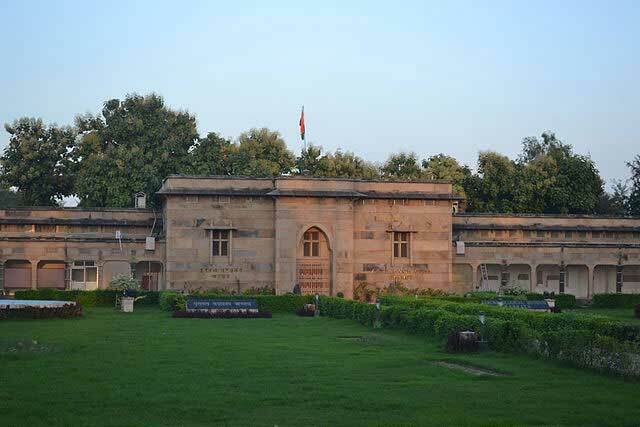 Here’s the list of the best places to visit in Sarnath. Built in 500 AD, the stupa marks the exact place where Buddha first taught Dharma after receiving Bodhisattva. The structure of the stupa was built in 500 AD and was commissioned to replace an earlier 249 BC structure by King Ashoka of the Mauryan Empire. The Dhamekh Stupa is a massive 43.6 meter tall cylindrical building with a diameter of 28 meters and is built with bricks and stone. The various stone carvings and sculptures in the building are exemplary of the Gupta artisans and the inscriptions are also amazing. 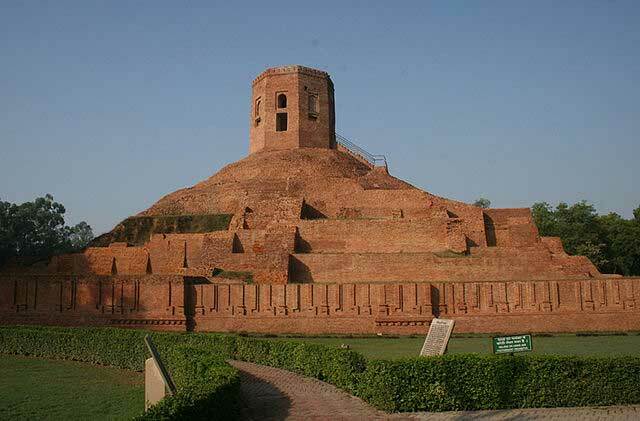 Another important Buddhist stupa in Sarnath, the Chaukhandi Stupa marks the exact location of the spot where Lord Buddha met his first disciples. The building was given an octagonal edifice to welcome the visit of the Mughal Ruler Humayun and was originally built during the 4th and the 6th centuries by the Gupta Kings. Maintained by the Archeological survey of India, the Sarnath Archeological Museum is one of the oldest sites of the organization. The museum houses the famous Lion Capital of Ashoka which is also India’s national emblem. The various antiquities stored at this museum date between the 3rd century BC and 12th century AD. Many of the artifacts and manuscripts housed here are important archeological findings that are related to Buddhism. Sarnath being a small town has fairly lesser amounts of attractions for the tourists. Nevertheless, the site is the birthplace of the world religion Buddhism and is thus one of the most important pilgrim spots for the Buddhists in India. The town has been mentioned several times in the writings of the Chinese traveler Hsuan-tsang and is considered an important historical town in India. 1. Is the Sarnath Archeological Museum open all the days of a week? 2. Are cameras or mobile phones with cameras allowed inside? 3. Is photography allowed inside? 4. What is the timing? 5. Is one day enough to complete Sarnath or two? 6. Is it SAFE for the families? Please answer ASAP. I’m planning to visit this December.